Welcome to Pest Control Supplies.com! 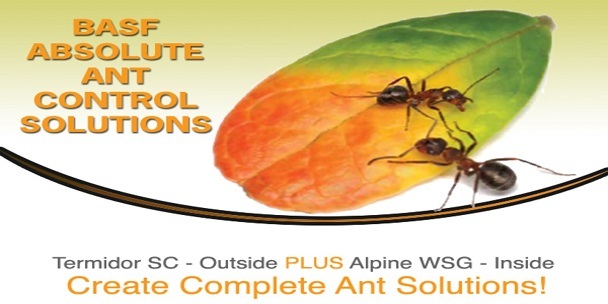 We are an online distributor of professional pest control products and supplies. We sell to homeowners, businesses, governments, or any other environment that needs pest control and protection. The products you will find within our website are all the exact same products and supplies that are used by professional pest control companies from all over the United States. Just click on your pest or product from one of the menus, follow label directions, and you are on your way to becoming a professional pest management professional! You won’t find these products in your local stores or home improvement centers because they are only sold to distributors whom in turn sell them to pest control companies or licensed individuals. Yes. If you are competent, can read and follow label directions, then you too can safely solve your own pest problems. If you need some help, feel free to email us or call us at 866-260-7453. It is important to remember, that individuals applying pesticides must do so in a manner not only consistent with federal laws, but also consistent with state laws and regulations, which differ from state to state. The following link will provide you with links to phone numbers, addresses, and web sites for the primary pesticide regulatory agency in each state and US territory. Ants are the number one pest for pest control companies in the United States. They can be a menace day and night. Here is a few great products to get you started: Termidor, Termidor Foam, Advance Carpenter Ant Bait, Alpine WSG. The number one revenue producing insect for pest control companies right now is the bed bug. We've got you covered. Here are a few products to get you started. 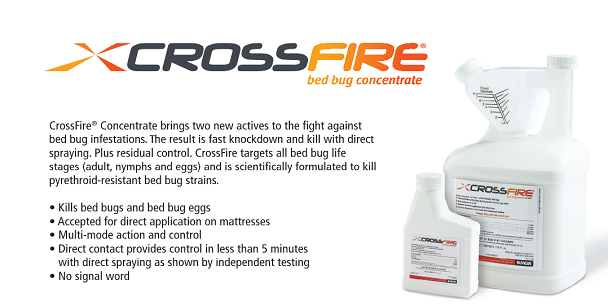 CrossFire Concentrate brings two new actives to the fight against bed bug infestations. The result is fast knockdown and kill with direct spraying. Plus residual control. CrossFire targets all bed bug life stages (adult, nymphs and eggs) and is scientifically formulated to kill pyrethroid-resistant bed bug strains. Bedlam kills bed bugs on contact, as well as eggs that have been directly sprayed. It provides residual control for up to 7 weeks depending on the surface treated. After vacuuming cracks and crevices in closets and other rooms infested, a Clothes Moth Pheromone Trap(s) can be placed in areas that contain items the larvae feed on, such as wool, hair, feathers, or fur. In small areas, we recommend just one trap. These traps can be placed into drawers, under or behind couches and cabinets or behind doors or on shelves in the darkened areas that these moths prefer. The lower profile also provides less risk of getting clothes stuck in the glue and it is more versatile. On the exterior, surfaces and areas where flies land and breed can be treated with a residual insecticide such as Demand, Suspend, or Tempo. Sticky traps such as the EZ Fly Trap may also be useful. fantastic bait such as Alpine Roach Gel. Pheromone traps will help you monitor your progress. To successfully control gophers, the sooner you detect their presence and take control measures, the better. We suggest J.T. Eaton’s Gopher Bait or Kaput Gopher Bait for best results. House mice thrive under a variety of conditions. They are found in and around homes and farms as well as in open fields and agricultural lands. House mice consume and contaminate food meant for humans, livestock, or other animals. Rodent control can at times be as simple as using traditional snap traps. Or, it can be more complex requiring the use of exclusion products or rodenticides and bait stations. Whatever, the case is, we have the professional rodent control products that will help you get the job done. There are several species of cockroaches throughout the United States. A few of the more common roaches include The American Roach, Oriental Roach, and the German Roach. Sometimes referred to as 'waterbugs' or 'palmeto bugs', cockroaches are under the order, Blattodea. The Stink Bug lives outdoors, but they may occasionally enter homes because of their large numbers. In terms of structural pest control, they are relatively harmless, as they don't bite or sting. They are ugly, smell, and can be a nuisance because of their large populations. Popular residual concentrates for Stink Bugs include Suspend SC, Talstar Pro, or Onslaught or Alpine WSG. Most ticks of importance include the Brown Dog Tick, American Dog Tick, Lone Star Tick, or the Black-Legged Tick (Deer Tick). On the exterior/perimeter, make a perimeter treatment, concentrating on areas where pets rest or run. Treat likely harborage areas like along paths, tall grass and other vegetation. For best results, treat the entire area where ticks could be present. Begin treating in the spring. Ticks may be re-introduced from surrounding areas by host animals. Continue treating until frost to control both larvae and adult ticks. 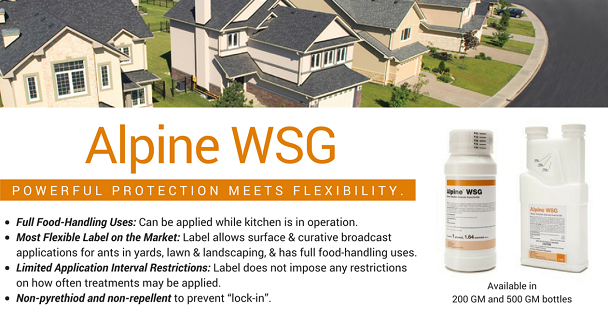 For indoor use, most labels will direct you to apply to areas where pests hide. These areas include baseboards, corners, storage areas, closets, around water pipes, doors and windows, attics and eaves, behind and under refrigerators, cabinets, sinks, furnaces, stoves, the underside of shelves, drawers and similar areas. Pay close attention to cracks and crevices. A few products labeled for ticks include Cy-Kick Crack & Crevice, Masterline Bifenthrin, or Suspend SC. Exposed Paper wasp nests are usually easily controlled using a wasp treatment product such as Wasp Freeze, Wasp-X, Tempo, or Suspend. The nest can be knocked down once activity has ceased. On structures where continuous paper wasp nest building occurs, treatment of the affected areas with a residual insecticide such as Tempo, Demand, or Suspend can be applied. Treating cracks, crevices, and voids with a dust formulation such as Delta Dust or Drione works great for preventative as well as curative purposes. Treat all cracks high and low. Any place that has a 1/4 inch gap or larger can lead to a comfortable, secure cavities. Does Mating Disruption Occur When Using Several Webbing Clothes Moth Traps?